Chris Eaton started his karate training over 25 years ago. He started with Andy Derbyshire in Wythenshawe, where he trained in Shotokan for five years. He then joined Clayton Murrain and Patrick Scanlebury at the E.W.S.K.A. the English Wado-Ryu Sport Karate Association. He became instructor and taught classes for them in Sheffield, Stockport and Manchester. During this time he also trained with the famous Thai Boxer Ronnie Green in Partington, where for over two years he learnt all aspects of Thai Boxing. In 2007 he joined the F.S.K.A (the Freestyle Sport Karate Association) in Manchester and opened his own club in Sale. At present there are just over thirty students who regularly attend classes. Some of the students have already gained trophies at many of the competitions which the club attends. 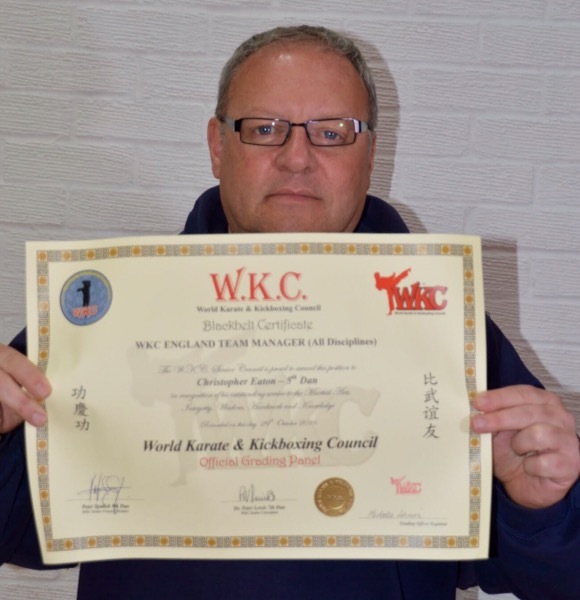 Chris was awarded his 5th Dan at the 2014 WKC World Championships in Albufeira, Portugal. In 2016, he was appointed to the role of WKC England Team Manager (All Disciplines).